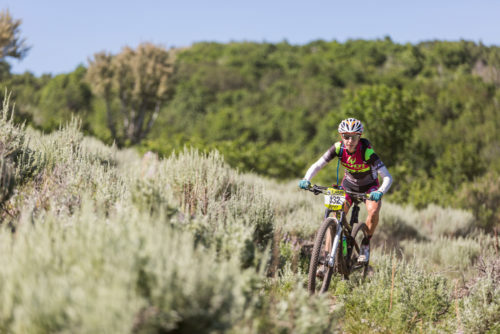 The I-Cup Race Series held its second Endurance Series event on June 25, 2016 in Heber City, Utah at the Wasatch Back race. The course of the Wasatch Back race featured a 21-mile loop in the mountains just south of Jordanelle Reservoir. Utilizing what is known as the Coyote Loop Trail, the course ascends rapidly from the parking area of the campus, gaining the majority of its roughly 1,700ft of climbing in the first ten miles of the lap on sinuous, switchbacking singletrack. Racers were assigned either one or two laps of the course, with all elite and expert categories taking on two laps. After a brief delay due to technical difficulties with the timing system, the elite men’s field took the start at approximately 8:30. A hard charging Drew Free (Kuhl/Pivot Cycles/Go-Ride) led the field from the gun, soon joined by Justin Lindine (Apex/Hyperthreads/Vittoria). These two quickly separated themselves from a chase group that at various points consisted of Justin Desilets (Team Revolution Bicycles), Chris Holley (Kuhl/Racers Cycle Service) and Jason Sager (Hyperthreads). Lindine was able to take the lead after Free had to briefly remove a piece of brush that had become lodged in his drivetrain. From there on out, it became a pursuit match with Free keeping Lindine within 45 seconds for the entire first lap. Justine Lindine (Apex/Hyperthreads) on his way to another win at the Wasatch Back 50 Intermountain Cup Endurance Cross Country Race held on June 25, 2016 in Heber, Utah. For Free, after a fast start it was as much about staying error free as it was fast. “There are a few sections towards the top of the climb that are difficult to ride very fast,” he said. “Your best bet is to try and ride them smoothly. I don’t get to ride this trail as often as I would like, so it is really unique to be able to race here. With two big 21-mile loops it feels really remote out on the backside of the course. 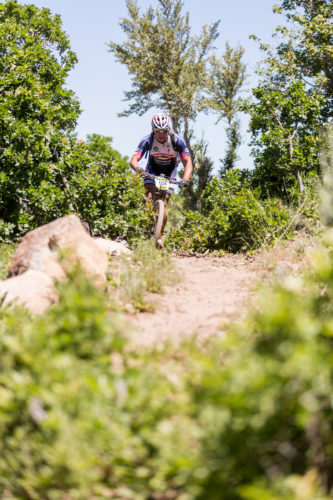 It is really a lot of fun to ride these trails fast.” Lindine finished in the top spot, four minutes ahead of Free. Behind the two up front, the battle for third changed hands first from Desilets to Holley, then Holley to Sager. But during the second lap Holley was able to get a gap over Sager on the climb and hold it to finish three minutes behind Free. “I felt really good overall,” said Holly. “But the way Lindine and Free rode away from the group, I knew I’d be racing for third.” Sager was able to finish fourth with Desilets hanging on for fifth. In the elite women’s race Jen Hanks (Pivot/DNA Racing) surged to an early lead on the courses opening climb hoping to get ahead of other category race traffic as much as possible. Despite gaining time early in the first lap, she was caught heading onto lap two by a surging KC Holley (Kuhl/Racers Cycle Service). “Towards the end of the first lap I let myself get a little too comfortable in the lead and let off the gas just enough that a hard-charging KC Holley caught me,” Hanks said. Holley had been trading second position with Jennifer Wolfrom much of the first lap. The decent, however, changed things. “I was able to get some space as we finished the lap and caught Jen at the feed zone as she stopped to swap hydration packs,” Holley said. However, with a clear course for the second trip up the climb, Hanks was able to again put in an effort that gained her an advantage. “My second lap was only three minutes slower than my first,” she said. 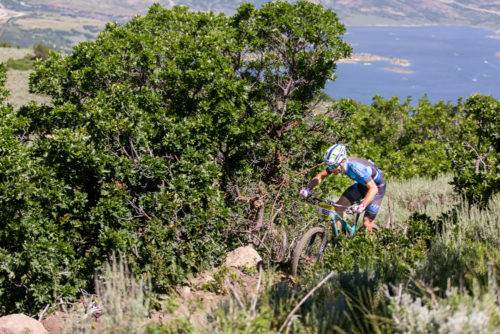 “Last year, I completely detonated on the second lap, so I was happy to finish strong.” She added, “This is my second time racing the full Wasatch Back course and it is really a great course. Big climbs, big views (if you take a moment to look) fast descents, and a fair amount of chunk with some tricky switchbacks to keep you on your toes!” Putting her prior course experience to good use, she was able to come in 3:55 ahead of Holley in second. Further back, Wolfrom rounded out the podium in third. 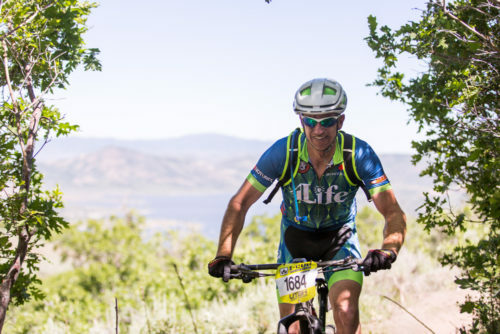 Matt Brown finished second in the expert 40-49 category at the Wasatch Back 50 Intermountain Cup Endurance Cross Country Race held on June 25, 2016 in Heber, Utah. Altogether 160 racers tackled the challenging backcountry course on Saturday in Heber, a slight increase in the turnout from last year’s edition of this race. As all the categories finished their races, and results were finalized, racers were treated to post-race refreshments compliments of Trip C’s food truck. Dishing up gourmet grilled cheese sandwich variations and other tasty treats, the truck was a big hit with hungry racers. The temperature, while warm, was distinctly milder than the days leading up to the race, making for pleasant lounging in the shade of the race pop-up tents and a perfect and picturesque backdrop for this stop on the I-Cup event calendar. Rick Morris finished 7th in the expert men 60+ category at the Wasatch Back 50 Intermountain Cup Endurance Cross Country Race held on June 25, 2016 in Heber, Utah.